XM521, Honeybear, 8x8, amphibious, 1959, built by Detroit Arsenal. It featured honeycomb material between 2 layers of aluminum for the chassis to increase lightness and swim ability. Fitted with 105 hp engine, independent coil spring suspensions, limited slip differentials, 2 propellers, it could move in water. Speed 88 km/h and 8,3 in water, ground clearance 465 mm, mass 2.1 kg for 2,5 t capacity. TILCAR, Tactical Infantry Load Carrier Amphibious Remote, 8x8 or 12x12, amphibious, 1965, built by Bisset-Berman, Santa Monica, CA. With 95 hp, 1 ton capacity and Terra Tires powered by chains, it was not so practical as Mule 4x4 M274. VIPER, Vehicle, Infantry, Pontoon-Equipped, Reconnaissance, Experimental 12x12 or 14x14, amphibious, 450 kg payload, Terra-Tires equipped, no suspension and skid steering. 8x8 robot, 2006, from Rheinmetall Defense, Germany. Pict J M M at Villepinte, 2006 06. Venema 8x8 amphibious, 2004, home built in The Netherlands. 20 km/h, skid-steering. www.amphibiousvehicle.net, very interesting site. 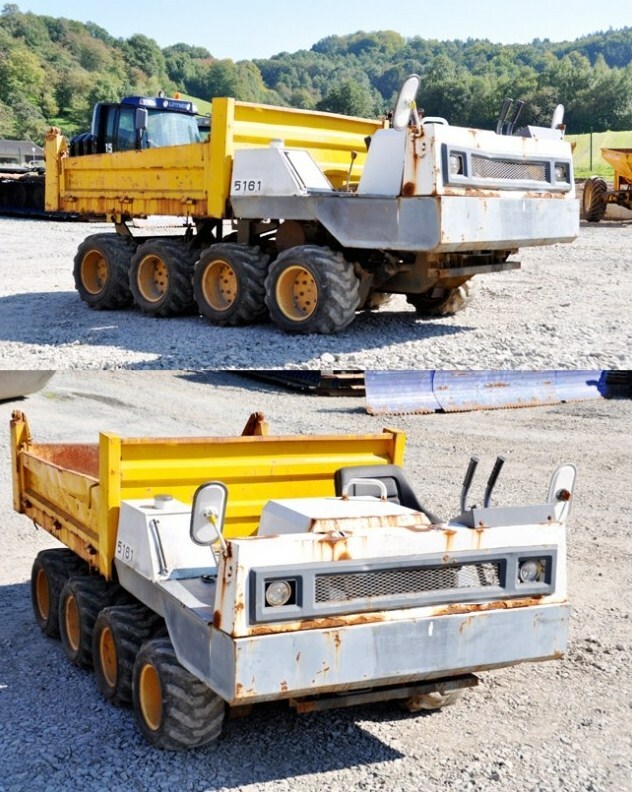 Prototypes 6x6 and 8x8 based on Unimog in 2003, for Europa Truck Trial. Center of gravity was higher than 4x4 Unimog and made them quite unstable. XM384, Amphibious, 8x8, 1958-59, experimental vehicle built by Detroit Arsenal from M151 jeep. 70 hp, coil spring suspension. Picture from book of Fred Crismon ‘US Military Wheeled Vehicles’, Crestline Publishing (Motorbook), 1983. XM384, 8x8, 1957, 1-ton capacity experimental vehicle issued from 1/4-ton Ford M151 Jeep and assembled at Detroit Arsenal. On second picture, wheels, on a walking beam, are surrounded by a traction device. Picture from book of Fred Crismon ‘US Military Wheeled Vehicles’, Crestline Publishing (Motorbook), 1983. Amphibious Ersaco 8x8 ATAC prototype : All Terrain Amphibious Carrier of 2 t payload, Ersaco Ltd, Ludgershall, Wiltshire. Pict from Military Logistics, 1988. Stewart & Stevenson SS300 8x8, issued from Ersaco, was manufactured in 1996 in Texas and quite different of its model. Engine Cummins 160 hp, payload 2260 kg, Dana axles. Doc J M M .
Company S E Opperman Ltd of Elstree, Borehamwood, unveiled in 1942 the Scorpion, an amphibious 8 wheeled drive, five axle. No suspension and steering by brakes on middle axle. The single axles, front and rear, were a source of danger under certain conditions when the entire 2 T mass of the machine were suspended on them. Pict from review 'Classic Militry Vehicles', 2003. Paca 10x10 Amphibian from 1989 could carry 3000kg, empty mass : 4 t, speed 85 km/h, Perkins engine, Ground pressure : 0,53 kg/cm², 2+12 men. Manufactured by Rapid Deployment Vehicles Limited, Burnley, Lancashire, UK, it has been series produced. Pict from Military Logistics, 1989.